Bhutan was, for many years, one of the least accessible destinations to Tourists. This is still part of the appeal for those that travel to the country, as it is one of the few places that still offers real opportunities for adventure. By far the best way to explore this stunning land is to head into the unknown and see what you discover along the way, however, there are also a few must see attractions that you should also schedule into your trip. 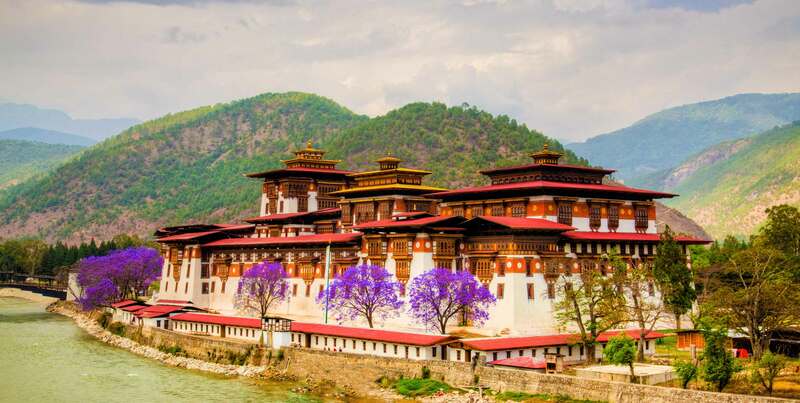 Based in an old watchtower dating from 1656, the National Museum overlooks the beautiful Rinpung Dzong and houses some of the greatest Bhutanese artwork of the last 1,500 years. As well as bronze statues and amazing paintings there is also a vast collection of historical items that tell the story of Bhutan over a series of floors. Bhutan has two things in abundance; Dzongs (fortresses) and goemba (monasteries). Both can be seen perched on hills all across the country, casting their gaze over the land that lies below them, but Gangte Goemba, Taktshang Goemba and Trongsa Dzong are some of the most dramatic and impressive examples of this traditional form of Bhutanese architecture. For most, the attraction of Bhutan lies in its beautiful countryside, not in its cities, however, Thimphu is well worth exploring, even if just for the beautiful aromas and busy atmosphere of its beautiful weekend market. Exotic foods like dried fish, homemade cheese and even yak legs can be bought here, among the countless stalls selling tourist souvenirs.